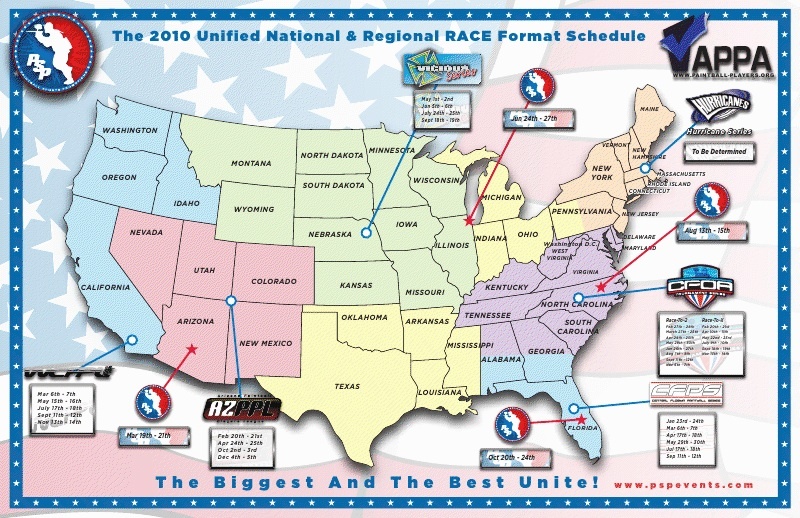 January 15, 2010 – Paintball Sports Promotions (PSP) is pleased to announce the creation of a network of affiliate regional tournament leagues that, along with the PSP, share the goal of introducing the “RaceTo” format to players throughout the country. These affiliated leagues will work together to provide a consistent experience for players across leagues and divisions, as well as create a universal player ranking in conjunction with the APPA that fits both the regional and national levels. Over time, this system will provide a national ranking for teams at every level across the United States, allowing a player to compare his/her team to those playing in other leagues on the other side of the country. As this system grows, the ability to rank teams will extend to ranking individual players. For the first time, the sport will have a true national ranking for both categories, enabling players to measure themselves against competitors. By partnering with these leagues and implementing player rankings, the sport of paintball will be unified from top to bottom, coast to coast. This network will continue to pursue expansion across the country with the ultimate goal of creating a more unified sport.